Where Fitness Equipment Gym Upholstery Vinyl is concerned our range of Gym Upholstery Vinyl is of the highest quality and has been the first choice of many Fitness Equipment Manufactures for many years! Our Gym Upholstery Vinyl is developed for use within the Fitness Industry, Contract Upholstery, Physio Therapy and Medical Industries. Our Gym Upholstery is fully Fire Retardant to Crib-5 with Anti-Bacterial protection to protect against harmful bacteria including MRSA and is treated with a Stain Erase coating to increase resistance to everyday staining. Long lasting, flame retardant, abrasion resistant, tear resistant, easy to clean and resistant to disinfectants our gym vinyl upholstery is available cut to length from 1 metre through to a full 25 metre roll and has a standard width of 1370mm. 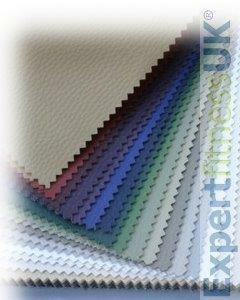 A Quality Gym Upholstery Vinyl that out performs others!